I was never a fan of tomatoes until my dad started growing them in our yard. That first taste of sweet, juicy tomato flesh still warm from the sun was all it took – I was hooked, and looked forward to fresh summer tomatoes from that point forward. We grow plenty of our own these days – a variety of heirlooms and hybrids – but while I wait for our homegrown beauties to ripen, I buy plenty of tomatoes from the growers at the Greenmarket. Walking around, seeing the variety of shapes, sizes and colors, I’m like a kid in a candy store. I worry sometimes about buying more than we can eat before they spoil, but somehow that never happens. 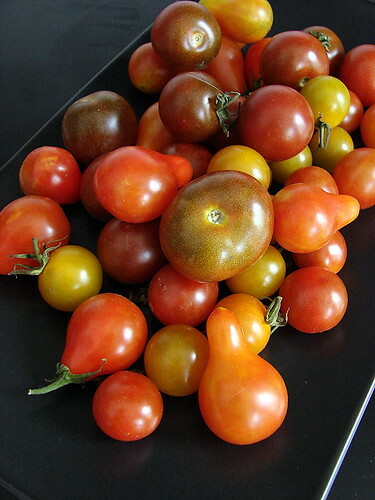 Others have written about their love affair with heirloom tomatoes; I adore them as well, but my real favorites are the little grape, cherry and pear varieties. I can polish off an entire pint myself, popping them into my mouth like bon bons. I love them straight or tossed with olive oil, bocconcini and fresh basil; I love them halved in green salads or mixed into pasta, grain or bean salads. I love them skewered and tossed on the grill until their skins begin to blister and split or, as the season wanes and the weather is more oven-friendly, I love them roasted on a sheet pan with salt and olive oil, ready to spoon on top of a slice of grilled bread. These little gems really shine when cooked just briefly with garlic and onion sautéed in plenty of olive oil, hot cooked pasta, and a couple of big handfuls of baby arugula – probably my favorite summer pasta dish, one that takes just minutes to cook and won’t heat up the whole kitchen in the process. Cook pasta in plenty of boiling salted water approximately 8-10 minutes, until cooked but still firm to the bite. Heat several tablespoons of olive oil in a deep skillet, add onion and salt and cook over medium heat until the onion is soft and translucent. Add garlic and chile flakes and continue cooking until the garlic is golden. A minute or two before the pasta is done, add the tomatoes to the pan, season with a bit more salt, add a ladleful of the pasta water and stir. 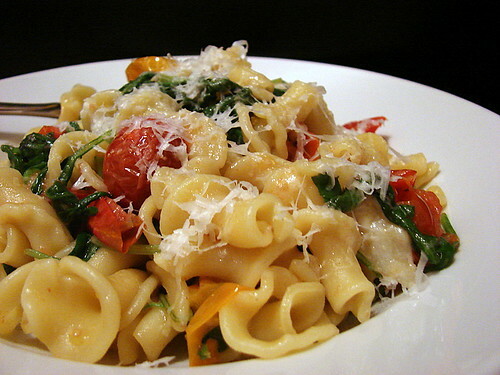 With a slotted spoon or spider, transfer the pasta to the skillet and gently toss with the tomatoes. Turn off the heat and add the arugula a handful at a time, tossing gently to incorporate. Add cheese and serve. I was about to tell you I compiled a mini tomato roundup and put you in it, but WordPress already took care of that! 🙂 Great entry. As usual, Jennifer, you make excellent use of well-chosen ingredients! Home grown really does make the difference with tomatoes. I came late to my love of them too, and it was my wife growing them in our yard that made it happen. Whatever your source for tomatoes, NEVER refrigerate them. That will rob them of their flavor. when i win the lottery this saturday i am going to hire you away from whatever you’re doing and you can be my personal chef. ok? Terry – Thanks! And so very true about not refrigerating tomatoes. That makes me cringe when I see it! my friends just left and before i went to bed i HAD to tell you that this was amazing. i used orechiette and then followed your recipe to a T. it was a SMASH. i felt like i was back in italy. thank you jennifer. simple and delicious. a perfect recipe. Oh, that’s wonderful to hear! I’m so glad it was a success! This was a lifesaver last night after a long day at the office and running errands. What a divine dinner it was. We raised our glasses to you and this great blog! Thanks so much, Mary! I’m glad it was a hit!